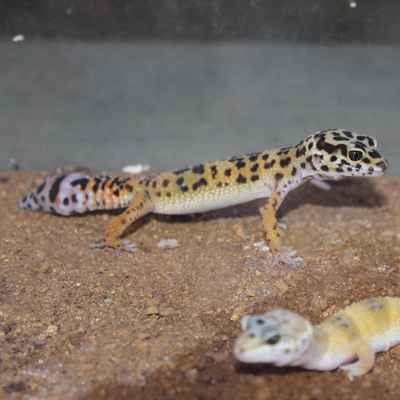 A 10- to 20-gallon aquarium houses one or two leopard geckos from hatchling to adult size. Larger tanks tend to cause the geckos to stray away from their proper heat and hide box. Any cage you choose should be at least 1 foot tall. Be sure to have a secure screen top on your gecko cage that will support a light fixture, provide good ventilation and keep out bothersome cats. A hide box filled with moist moss or vermiculite is needed, so your leopard gecko can shed its skin properly. Live or artificial plants can be added for a nice decorative touch. The best way to heat your leopard gecko is by using an undertank heating pad or tape. Heating one end of the cage is best. This allows for a temperature variation that your lizard needs. Heat rocks tend to become too hot for leopard geckos and should be avoided due to the risk of burns. For viewing, a simple low-wattage light can be placed overhead on the screen-cage top and left on 12 hours a day. Because leopard geckos are active at night (notice their vertical pupils), they do not need to bask under a special UVB light. The ideal temperature in the hide box is 88 to 90 degrees Fahrenheit at all times. The ambient air temperature of the room they are housed in should be above 73 degrees. Leopard geckos like low humidity in their tank and should only be misted lightly once to twice a week. Leopard Geckos are mainly insectivores, so they eat mostly insects such as small crickets and different types of worms. As adults they will also eat the occasional pinki mouse. These can be bought frozen and are very good for geckos – just be sure to defrost and bring to room temperature before feeding. Reptiles need to have a vitamin/mineral supplement with calcium and phosphoros. This supplement should be sprinkled on the adults food items at every second or third feeding and more often with very young reptiles. A shallow water dish with fresh water must be available at all times. It should also be stable, so it cannot be spilled. Cage substrate should be kept dry, so be careful about spillage. Make sure that young and adult leopard geckos can climb easily out of the dish you use. Vitamin drops should not be added to the water. 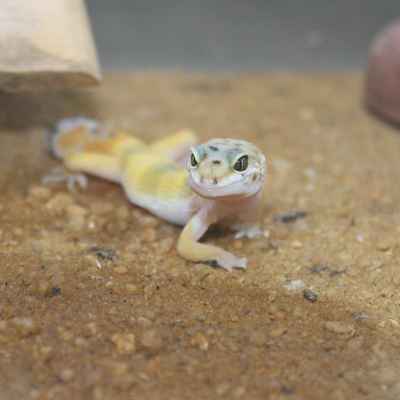 Leopard geckos are generally very hardy and healthy when kept in the right conditions.